Cold pressed USDA certified organic Pomegranate seed oil is a velvety and luxurious oil. It gently coats the skin, providing essential fatty acids to assist in skin cell regeneration. It greatly assists in combating age related skin issues and is used to revitalize dull or mature skin and promote a lustrous complexion. USDA certified organic Pomegranate seed oil contains valuable nutrients including estrone, Vitamin B, Vitamin C, potassium, magnesium, and phosphorous. It also has natural estrogenic properties, antioxidants, is anti-inflammatory, anti-microbial, improves skin elasticity, and protects the skin. It provides relief from minor skin irritations and inflammation, including dry skin, eczema, psoriasis and sunburned skin. The conjugated fatty acids give it strong anti-inflammatory properties, which help to reduce swelling and ease muscular aches and pains. Several recent studies, including one conducted by the University of Michigan Medical School (published in the February 2006 Journal of Ethnopharmacology), have shown that pomegranate seed oil stimulates keratinocyte proliferation, promoting regeneration and strengthening of the epidermis. This study complements other recent studies, which have also shown the beneficial results of using pomegranate seed oil. Virgin pomegranate seed oil is a exotic addition to cosmetic applications, personal care formulations, soaps, skin, and hair care. 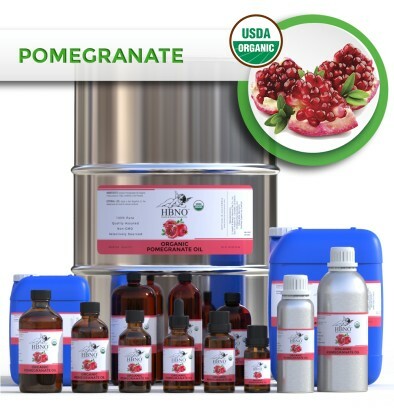 HBNO is pleased to offer organic pomegranate seed oil in bulk and wholesale quantities. We can supply any amount of oil to anywhere in the world.